By now we all know what is the latest chartbuster from last few weeks. 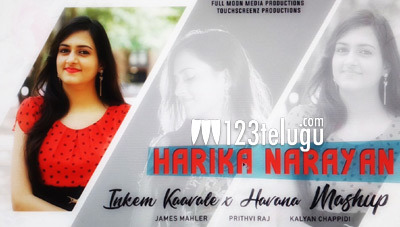 It is undoubtedly Inkem inkem inkem Kaavale from Geetha Govindam. The haunting tune of the composer Gopi Sundar mixed with the awesome vocals by Sid Sriram and apt lyrics of Ananta Sriram made this an instant chartbuster. Even the likes of Gowtham Vasudev Menon could not resist but appreciating the song. Meanwhile in the youtube world there have been lot of cover songs for this one, both dance and audio. Each one has its own peculiar beauty in it. Here is one such video which is taking it to the next step. It is a mashup of Inkem inkem inkem kaavale with Havana by Camila Cabello. This one is like a music lover’s heaven. It is sung by an upcoming singer Harika Narayan from Telugu Film Industry and shot in beautiful uptown localities of Dallas, Texas, USA.